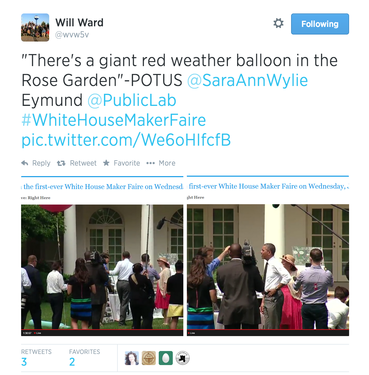 Eymund Diegel, a Public Lab organizer and member of Public Lab’s board of directors, from Brooklyn New York and I had the great pleasure of showing work from the Public Lab community at the 1st White House Maker Faire yesterday June 18th 2014 (#NationOfMakers). The event was by invitation, we nominated a set of Public Lab organizers and members based on their interest in participating. Here are bio’s for the 5 organizers we nominated. Public Lab Community Nominations for Attendees to the 1st White House Maker Faire Please find below short descriptions of a few of Public Lab’s members who have used Public Lab tools to study environmental health issues in their communities. Anyone of them would greatly add to the maker faire event. Each of their work demonstrates in a unique way how Open Source science tools are enabling grassroots engagement in meaningful, transformative environmental health research. From Chicago, Illinois: Olga Bautista is a community activist and mother of two girls ages six and one. She was born and raised in South Chicago, an area where there has been growing concern about the environmental hazards of petroleum coke or "petcoke," a waste byproduct from tar sands refining. In addition to being an LSC parent representative and an advocate for students at her daughter's elementary school, she is also a co-founder of the grassroots environmental justice organization Southeast Side Coalition to Ban Petcoke. Olga has helped to galvanize the area's Mexican-American community as well as other residents in this diverse region. They have been using Public Lab balloon mapping to illustrate the scale of the waste problem in order to seek better regulation, monitoring and prevent human health problems. The maps have been used to raise awareness among officials at Chicago’s City Hall as well as among community residents. From Brooklyn, New York: Eymund Diegel is on Public Lab’s Board of Directors. He is resident of Brooklyn and has lead efforts there to map the Gowanus Canal Superfund site. He works with the Gowanus Canal Conservancy, contributing Citizen Science research to the EPA’s Community Advisory Group for this Superfund site. Their grassroots maps, generated by canoe teams of balloon camera photographers, have assisted in the site's clean up, by identifying unrecognized hazards and opportunities, including historic paved over stream flows into the canal. Additionally, their maps have identified a potential cemetery, currently buried under the Superfund landfill, of the first American soldiers to die in the 1776 Battle of Brooklyn. Based on these maps, the Community Advisory Group has succeeded in having “daylighting” of the original stream bed included in revised Federal and City Canal restoration plans, and an international park design competition will be held over the summer to commemorate the Revolutionary War site. Bronwen Densmore is a member of Public Lab's Organizing Committee from Brooklyn, New York. She is also an instructional design librarian and is interested in ways that emerging technologies, open research, and community driven data collection efforts can empower communities to participate in conversations and decisions about the space they live in. As an educator, she gets excited about the way that Public Lab tools and the Public Lab community can help to facilitate research outside of the academy, as well as the ways that emerging technologies provide more accessible platforms for knowledge-building and more inclusive conversations about space-based issues. As someone with an arts (rather than a science) background and a believer in maker/DIY approaches to technology, she is also interested in the ways that participatory science encourages unconventional and interdisciplinary approaches to problem solving. From Park County, Wyoming: Deb Thomas is a Community Organizer for Powder River Basin Resource Council who has pioneered field testing of a new Public Lab tool to map community exposure to the neurotoxic gas, Hydrogen Sulfide. Deb Thomas is a fourth generation Montanan, who now lives in Park County, Wyoming. For the past 15 years she has worked as a grass roots organizer for Powder River Basin Resource Council in the Big Horn and Wind River Basins of Wyoming. Deb works to educate and empower people to conserve their environment, their health, and the health of future generations. Deb was featured in the November, 1993 O Magazine for community work she did, in part with Public Labs, in North Central Wyoming. For the Maker Faire, Deb would present her organizations research mapping Hydrogen Sulfide for the first time. It would be excellent to spotlight her work, as we are about to publish this work and begin developing a purchasable kit for other communities to try this method. From Philadelphia, Pa Sean McGinnis is a Public Lab Organizer from outside Philadelphia, Pa. Sean is a Software Developer for the New Jersey Office of GIS and has been doing field work and community outreach helping to connect organizations in New Jersey and Eastern Pennsylvania and doing public speaking events around New Jersey, New York and Pennsylvania. 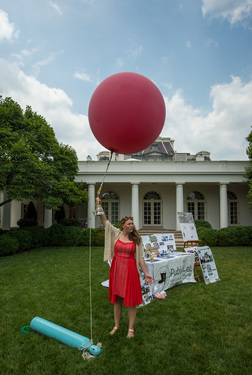 Since October, 2012, he has coordinated multiple balloon mapping flights and hosted multiple hands on balloon mapping workshops in Philadelphia and Southern/Central New Jersey. He is active in posting to Research Notes including; Raspberry Pi Camera Rig, Line Reel for Balloon/Kite String and local events and news in the Philadelphia and New Jersey Chapters' wiki page. Eymund was selected by the White House based on the Gowanus Low Altitude Mapping Project's amazing work with the Gowanus Canal Conservancy mapping the Gowanus Superfund site, in particular vegetation and buried streams. Diegel spoke eloquently about how the precision of grassroots mapping reveals ghosts in our landscapes that cannot be captured in the resolution of satellite imagery. 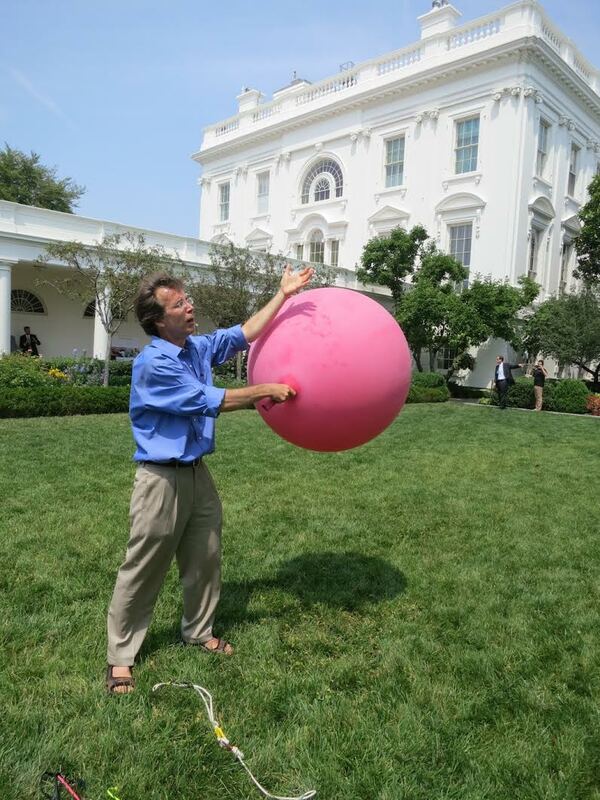 And made the President laugh by joking about how we jump to recapture the balloon. As a co-founder and current Public Lab organizer, I spoke broadly about how our community is evolving from Jeff Warren’s inspirational grassroots mapping tool to developing a whole array of civic science tools. Under the banner of science “By the People, For the People” we talked about how the Maker Movement is reimagining science to focus on issues of civic importance such as environmental justice, protests, industrial monitoring, wetland preservation, invasive species identification and supporting the development of small scale farming. During the President’s visit to our table we were able to show him maps from a current effort in Chicago to map Petcoke waste piles from Tar Sands refining that are being stored along the Calumet River and exacerbating existing environmental injustice experienced by the community. 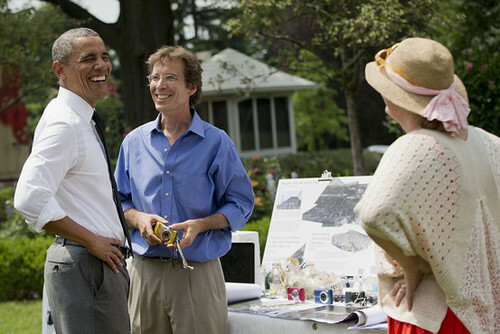 You can just see the maps behind us in the photo with President Obama. I presented a project I’ve been involved in developing, a method of mapping a neurotoxic gas Hydrogen Sulfide (H2S) associated with natural gas and oil extraction using photographic paper. We showed the first map from this project which is helping residents and community organizers visualize for the first time, the rotten egg smelling gas emanating from oil extraction occurring on this Wyoming ranch. H2S is linked to health problems in both people and livestock. The ranchers have experienced symptoms such as burning in the eyes and nose, painful breathing and neurological impairment that correlates with H2S exposure. Additionally, correlated with H2S contamination their livestock have experienced high rates of preterm birth. Click here to learn more about this project. Other presenters also highlighted how the Maker Movement is changing science, health care and education; including Stanford bioengineering professor Manu Prakash. Prakash demonstrated his remarkable 50 cent microscope. This project should be of great interest to the Public Lab community. The National Institute of Health demonstrated it’s 3D Print Exchange where they gather and share open source 3-D models of proteins, bacteria and parts for scientific tools. Sandra Richter of MIT’s Media Lab showed her environmental sensing bench, Soofa. Soofa, beyond providing solar powering for electronic devices, reports air quality data in real time. For Boston Public Lab folks 12 of these will be installed in Cambridge and Boston soon. In the spirit of designing low cost devices, innovator Jane Chen a student at Stanford showed her project Embrace, a $200 incubator for pre-term babies. Other projects emphasized how Making can transform learning environments, such as Jay Silver’s MaKey MaKey, which can be used to turn fruit into musical devices—like a banana piano. Ingrid Gustafson, a middle school science teacher from Massachusetts, showed how her students used MaKey Makey to turn their artwork into interactive demonstrations of ecological change. Touching the wired painting of forest wildlife causes the selected wildlife to populate an imagined computer ecosystem. I managed my rapidly expanding deer population by introducing ravenous wolves and restored the deer’s soon decimated ranks by increasing plant fodder. Another cool kid friendly project that might interest Public Lab members is Squishy Circuits, play-dough that conducts electricity, developed by teacher AnnMarie Thomas. Her daughter Sage, showed Eymund and I how to light an LED with the dough. It would be interesting to see what the Public Lab community could Make with any of these projects! This review just touches on a few of the many amazing projects we were able to see. Overall it was an inspiring day, that underscored how DIY manufacturing is creating new jobs, new ways of learning, and new ways for the public to actively transform technology and science. Thanks to the White House for the invitation to attend this remarkable event. And a big Thanks from Eymund and I to all of the Public Lab Community, we were honored to share and celebrate your work democratizing environmental science. May it continue Public Lab’s mission of Making a difference in our shared environmental health problems through grassroots, community science using home-made tools. Eymund's ode to balloon deflation @the end.